Use on all cement, latex and sanded grout, unglazed quarry tile, brick and masonry. Achieve an invisible water-repellent seal and minimize the effects of soap, dirt, grease, grime, alcohol, mildew and food stains. Turn stained grout new again. Renews up to 75 sq. ft. of grouted tile area with easy to use applicator. White. Seals and protects grout lines. Resists mildew, dirt penetration and discoloration. Can be used with colored grout. Penetrating formula for interior or exterior grout. For the protection of granite, marble, travertine, slate and grout. Penetrates into the surface and forms an invisible barrier that is resistant to moisture and stains, while allowing vapor to escape. Resists water and stains. USDA approved. UV transparent. Covers up to 250 linear feet per can. Formulated to clean and maintain the natural beauty of stone. Contains an Aqua Mix sealer in its formulation to reseal as it cleans. Non-acidic formula. Penetrating sealer that resists most common oil and water based stains as well as dirt and grease. Protects grout, Satillo, porcelain and quarry tile, terra-cotta, masonry, brick, concrete, and natural stone. Will not leave a difficult, hard to remove residue. Low odor, water-based, neutral pH formula. On polished or dense surfaces. 1 quart covers 200-300 sq. feet while 1 gallon covers 800 to 1200 sq. ft. On porous surfaces 1 quart covers 50-100 sq. ft. while 1 gallon covers 200-400 sq. ft. 2-3 hour drying time. Can be recoated in 24 hours. Formulated to clean and maintain the natural beauty of your stone. Use on marble, travertine, limestone and slate. Contains Aqua Mix sealer in its formula to reseal as it cleans. Non-acidic. Penetrating sealer that resists most common oil and water-based stains. Can be used to apply sealer to sanded or non-sanded grout while in a standing position with 360 nozzle. Protects sanded and non-sanded grout joints from grease, coffee, wine, cooking oil, bath oils, colored juices, ketchup, mustard and every-day dust and dirt to keep grout bright and new. Covers 525 linear feet per 15 oz can. Designed for the protection of natural stone, tile, grout and masonry surfaces. Forms an invisible barrier that is resistant to moisture and stains while allowing vapor to escape. Not a surface coating and will not alter the natural look. Treated surfaces are harder and less slippery. Ok for food areas. UV transparent. Covers approximately 1,000-4,000 sq ft per gallon. 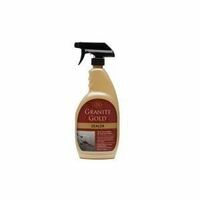 Granite Gold Penetrating Sealer, 24 oz Capacity, 6.4 % VOC, 7 - 8 pH, Liquid, Clear, 4 hr Drying Time, Slight Alcohol Odor/Scent, >250 deg F Flash Point, Media: Carbon Dioxide, Dry Chemical, Foam and Halon, Composition: Water, Flammability Rating: 1, Number of Mixing Steps, Temperature Range, Pressure Range, Resists, Includes For saltillo, terra-cotta, quarry tile, slate and flagstone. Seals the surface to resist stain, dirt and grease. Beautifies and enhances color. Provides scuff, mar and scratch resistance. Low odor. Will not yellow with age. Use in dry areas only. Covers 75-125 sq. ft. For saltillo, terra-cotta, quarry tile, slate and flagstone. Seals the surface to resists stains, dirt and grease. Beautifies and enhances color while providing scuff, mar and scratch resistance. Low odor. Will not yellow with age. Covers 75-125 sq ft.
Use as a sealer or grout release. Provides protection for marble, stone, porcelain, quarry and saltillo tile, grout, concrete and masonry. Repels dirt, oil and stains allowing easy clean up. Resists mold and mildew growth. Use when maximum protection is required such as in food preparation areas, floors and other high traffic areas. Allows moisture vapor transmission. Coverage on polished or dense surfaces 100-150 sq. ft. per pint, 200-300 sq. ft. per quart, 800-1200 sq. ft. per gallon. Coverage on porous surfaces 25-50 sq. ft. per pint, 50-100 sq. ft. per quart, 200-400 sq. ft. per gallon. Color enhancer and penetrating sealer for all types of porous natural stone and grout. Rejuvenates the color and appearance of worn, faded stone, tumbled-marble and other rustic-look stones. Can also be used to darken the color of grout. Provides long-lasting protection against oil, grease and stains. Low odor. Complies with all federal and SCAQMD standards for VOCs. Covers 30-190 sq ft per 24 oz. Coverage depends on surface type. Designed for the protection of natural stone, tile, grout and masonry surfaces. Forms an invisible barrier that is resistant to moisture and stains while allowing vapor to escape. Not a surface coating and will not alter the natural look. Treated surfaces are harder and less slippery. Ok for food areas. UV transparent. Covers approximately 1,000-4,000 sq ft per gallon. Penetrating sealer that resists most common oil and water based stains as well as dirt and grease. Protects grout, Satillo, porcelain and quarry tile, terra-cotta, masonry, brick, concrete, and natural stone. Will not leave a difficult, hard to remove residue. Low odor, water-based, neutral pH formula. On polished or dense surfaces. 1 quart covers 200-300 sq. feet while 1 gallon covers 800 to 1200 sq. ft. On porous surfaces 1 quart covers 50-100 sq. ft. while 1 gallon covers 200-400 sq. ft. 2-3 hour drying time. Can be recoated in 24 hours. Rejuvenates the color and improves the appearance of worn and weathered stone. May be used as a pre-grouting sealer. Allows moisture-vapor transmission. Seals and darkens the color of grout joints. Use on unsealed natural stone. Complies with all Federal EPA and SCAQMD standards for VOC. Covers 500-1,500 sq ft per gallon. Coverage depends on type of stone or tile, porosity and texture of surface, temperature, humidity and method of application. For commercial and residential tile and stone installations. Reduces crack transmission in ceramic tile or stone floors. Bonds directly to metal drains, PVC, stainless steel and ABS drain assemblies. Can also be used as a slab-on-grade moisture barrier under resilient flooring. Meets ANSI A118.10 for waterproofing membranes and ANSI A118.12 for crack isolation membranes. Meets Uniform Plumbing Code specifications for use as a shower pan liner. As a crack prevention covers about 110 sq. ft. at 30 mil thickness when wet per gallon. As a waterproof membrane, covers about 35 to 40 sq. ft. at 93 mil thickness when wet, 47 mils. dry. Use as a sealer or grout release. Provides protection for marble, stone, porcelain, quarry and saltillo tile, grout, concrete and masonry. Repels dirt, oil and stains allowing easy clean up. Resists mold and mildew growth. Use when maximum protection is required such as in food preparation areas, floors and other high traffic areas. Allows moisture vapor transmission. Coverage on polished or dense surfaces 100-150 sq. ft. per pint, 200-300 sq. ft. per quart, 800-1200 sq. ft. per gallon. Coverage on porous surfaces 25-50 sq. ft. per pint, 50-100 sq. ft. per quart, 200-400 sq. ft. per gallon. For commercial and residential tile and stone installations. Reduces crack transmission in ceramic tile or stone floors. Bonds directly to metal drains, PVC, stainless steel and ABS drain assemblies. Can also be used as a slab-on-grade moisture barrier under resilient flooring. Meets ANSI A118.10 for waterproofing membranes and ANSI A118.12 for crack isolation membranes. Meets Uniform Plumbing Code specifications for use as a shower pan liner. As a crack prevention covers about 110 sq. ft. at 30 mil thickness when wet per gallon. As a waterproof membrane, covers about 35 to 40 sq. ft. at 93 mil thickness when wet, 47 mils. dry.